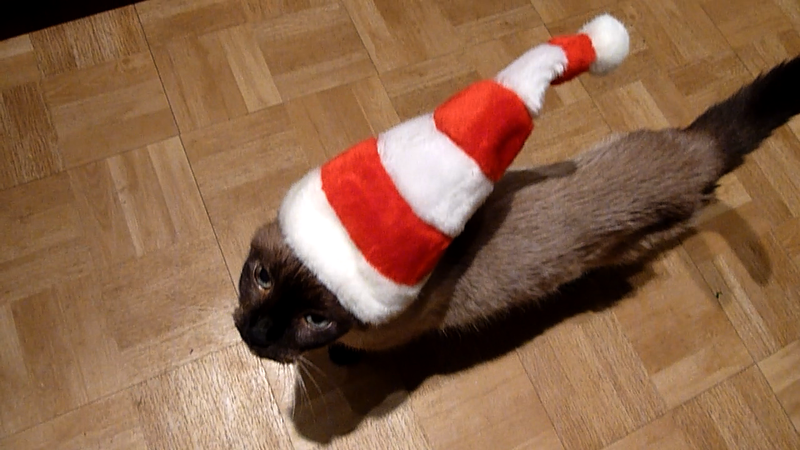 Christmas Cat Wishes - In A Brooklyn Minute (Week 86) from Luci Westphal on Vimeo. Multi-lingual, multi-culti expat cats in hats Jarmo and Lynch Kater wish all of you a Merry Christmas, Frohe Weihnachten, Buon Natale, Feliz Natal, Feliz Navidad, Joyeux Noël, God Jul, Boldog Karácsonyt and Prettige Kerstdagen. I'd like to thank Lynch Kater and Slow-Mo Jarmo for their cooperation, Scott Solary for making this video together with me, Teddy, the talking porcupine for the inspiration and last but not least all of YOU for watching, subscribing, commenting, rating, favoring and sharing! The featured song "Jingle Bells" was written by James Lord Pierpont and produced and performed by Kevin MacLeod (http://incompetech.com), who is making tracks available for free through Creative Commons License. Thanks, Kevin.